What a surprise as I watched this hidden gem. The last 20 years as movies got more and more frightful... I began looking at the family sections in movie rentals (where the "loser" movies were as they are often more innocent). I found there films that I could watch and enjoy and my spirit was not offended and sometimes even fed. Voyage of the Unicorn for instance with Beau Bridges was one such gem. But this one here was a real surprise! 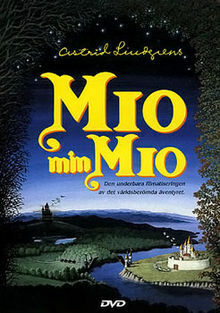 It turns out to not only be a worthy parable of a child's journey to their "Heavenly Father", but was taken from a book by Astrid Lindgren... and I just loved her Bullerbyn series which I'd been watching and reading for years. The Library used to be a good source for such movies, but when VHS went out, so did they. This little boy has been living as an orphan with some relatives that don't love him. He has to painfully watch his friend enjoy his loving supportive relationship with his father. When he can't take it anymore, he leaves and a mysterious angelic shop owner, Mrs Lundin, (a Mother Mary symbol for sure.. ) gives him an apple and a letter to mail, which turns out to be supernatural. The apple is the sign that he is the true son of a king (which I could see as a fruit of the Tree of Life ;) and the letter is written by Mrs. Lundin to the King of the Land of Faraway informing that his son has been found. She sends him basically, also true of our Divine Mother. And you get the sense she has been keeping an eye on him for a while and has known him but she stayed hidden as Mother Mary does too. Then, ok this part is a little weird, the apple falls and rubs into a little bottle that exhales the spirit of a kind of genie guy. I don't completely see the symbolism there and I am not certain whether Astrid Lindgren was intentionally doing even the parallels that I saw, it seems rather inspired to me, but anyway... the big genie head has the boy grab onto his huge white beard and off they go to the Kingdom of Faraway where his Father is King of all the land. As soon as he sees him even from a far distance, he knows exactly who it is! He knows and recognizes his true father. Even though Mio does not remember him and has lived on the earth for ten years or so with a completely different atmosphere and imposed identity. And the first thing as they are embracing joyfully, the King repeats his name consolably over and over,, "Mio, my Mio". The Father is at last consoled. His son whom He's been waiting for for so long is finally home. His only son. As Father's heart is precisely for us!. And Mio is ecstatic and fulfilled to know his real name, his real essence and be home with his father and begin to enjoy his inheritance in the wonderful Kingdom and land of Faraway. His Father lavishes gifts on him and he makes friends instantly. But, there is a sadness in the Kings heart. 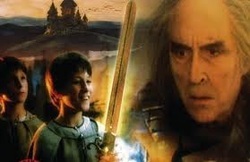 And Mio soon learns why from the majic well and the local children and his Father's own words. There is an evil knight near the kingdom who steals children. And when back at his castle, if they do not work for him, he turns them into slave ravens that are bound to fly around his dark castle. It is not said why the King can not overthrow him, but it is prophesied that the King's son would come "accompanied with a single friend" and overthrow this dark Lord Kato. And everyone knew this prophecy and everyone had been waiting for it. The Father is deeply sorrowful that Mio must face Kato, but He knows he must do it. Now here I think rather God the Father tells us exactly how to avoid satan and evil, but I rather applied it to how we must directly confront evil when it stares us in the face and overcome it through our authority in God the Father, as Jesus did in the temptations in the desert and He gave us the means to as well. I realize that this is not Father's plan "A". Eve should have simply obeyed. The Tree of Life and the Era of Peace are means of avoidance of evil rather than confrontation. It is said in the Poem that Mary never looked at evil, she prayed and looked at God. But many of us are weaker than that. So, the need to reject. I have learned that avoidance only works if we haven't accepted anything erroneous or worse to begin with, then we have to reject it necessarily and repentance and confession are a means to this as well. Along the way they are given gifts to aid their quest. And Mio is tested a few times as well. The panpipe. This could easily apply to the Rhythm and Harmony of God's will and the divine roll music plays both in Heaven and on Earth. The powers of music are beyond our comprehension. God the Father told Barbara Centilli for instance, that when we sing we pray twice. It will reunite Mio and his friend and "realign" them back on the path of their quest. And the bread which most certainly represents the Holy Eucharist, which Mio and Jum-Jum will share with a starving man they meet along the way. 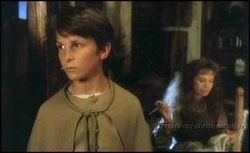 A weaver woman weaves Mio a cloak with invisible properties, which will help him to remain hidden during a critical period prior to his confrontation with Kato. Also Mary's cloak hides us to be unseen by evil at critical times. The rest of the movie you can find at the wikipedia page online, but eventually Mio must confront Kato. There is an illusion to the heart of Kato being transformed at the end... but since I paralleled him as a demon figure, they don't ever repent, but rather we could perhaps see the "heart" slain as a symbol of the defeat of evil and the transformation of all darkness into renewal and rebirth. Which ultimately is about to happen, and soon! here's a video someone put together that will give you some idea of the movie, though watching the movies is much better :) and calmer even meditative, I had to mute the volume on this one. U.S. Christians everywhere should know of this amazing online rental service where you can rent good movies at $9.99 per mo. (just return when done-to get another as many times till mo's over). Users give their reviews on the site so you know you're not getting a lemon, and most of these films just aren't available at Netflix etc. We've been doing it for a month now, and it's been wonderful! They are in California so if your east coast, apparently mail time is a bit longer, but if you pay an extra 2 dollars they will ship out your next selection the minute you drop the rental you've finished into the box. Can't argue with that! responsibility of being in addition, the spiritual leaders of their families. Hence the name, as it truly takes that in these times and in light of the fact of how these men themselves were raised without true fathers. The four men being Cops makes it an intense movie from the go and if you watch it with younger children, you'll want to skip through stuff as it's really a more mature film but tactfully done. So we highlight it for the glory it is giving our Father and the fact that it's a concrete immense sign that His Presence is with us now in a New Way and is having enormous effects on those who aren't even aware of the Consecration & Feast Day. This movie is AMAZING! I'm glad the foul language was not in the rental version we received too (I read the original had some). And I understand why they had to show such grave stuff at times (you can ask your angels to warn you when it's coming) but they did it in a way that you could fast forward easily if it's too intense but still experience the awe-inspiring impact of the message. It's so good to see that there are people out there who CAN make movies that do not overwhelm the viewer with trauma but "allow" them to receive the gifts the Lord want to give the viewer. The Christian group who puts these movies out is truly blessed. I saw that the movie made 16 times it's budget back in Dec. of 2011! So I'm really looking forward to what the Holy Spirit has in store for us through this team of His. present tragedy of fatherhood. Fathers in God, protect us from evil and keep us, when we are willing, in the Father. And in our modern society, they will be martyrs which is why the films name is "Courageous". But their laying down their lives for us, as Father God did through Jesus, will give us "Life" and Courage to in turn be martyrs, in real love for our true good and eventually, as we mature, for others. Because most importantly it will show us the Image of God the Father. Alex Kendrick (main guy) has such a presence that I am certain he would be just as convincing and awesome in any movie they did. He's kind of the same character in all of these movies, but because of the package and his talent and the Holy Spirits anointing upon his soul I'm sure, it works! And you experience a totally different experience. Great Glory is being given God the Father through these films and He is elated and consoled in a time where His children loathe Him more than any other time in history. We Bless you Father for giving us all this! Please continue to build a mighty fortress in this film team! And build us up in the gifts You give us through their hand. Amen! that was in the movie is actually available for fathers to make themselves and bring into their homes and into their communities and many men are. 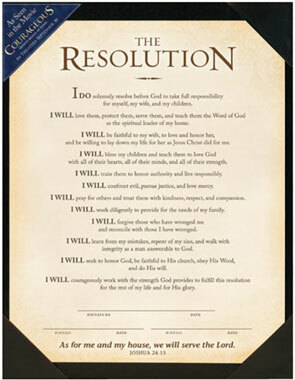 THE RESOLUTION is a bold declaration of commitments that men are making to be faithful to God as the spiritual leader of their home. As read in the movie, this print is ready for framing to mark the moment and celebrate the commitment being made to God and family.